It's not an especially brave act to proclaim, "I am a Jew." I belong to a privileged minority in the U.S. compared to most other minority groups. I have had no antisemitism worthy of the name directed at me in my lifetime. I have never had an opportunity taken away from me because of my religious/cultural identity. I have no personal complaints. But we are at a moment where I feel the need to say the words, "I am a Jew," if for no other reason than to let myself know I am not afraid to say them aloud or in print. And yet, to be perfectly honest, one reason for saying the words is because, in the current climate, being Jewish doesn't worry me, but saying "I am a Jew" does, a little. That is precisely the time to talk about it. We are seeing a frightening rise in antisemitism in this country. The latest incident I read about happened Thursday night. Standing alone, it would only be a shudder in the steady undercurrent of antisemitic hatred lurking beneath the surface in this country. But combined with the resurgence of antisemitic rhetoric and events which have been building since 2016 and have accelerated rapidly in the past weeks and months, it is a terrifying example of what could become regular occurrences. Comedian Ilana Glazer scheduled a get-out-the-vote event at a Brooklyn synagogue Thursday night where she was going to interview a journalist and two Democratic state senate candidates. It was canceled because antisemitic graffiti was found on inside walls of the synagogue, including “Die Jew Rats,” “We are here,” “Hitler,” “Jew Better Be Ready” and “End it now." The usual response would be to increase security at the event and carry on as planned. Don't let the haters win. But not this time. Not in today's climate. After the killings at a Pittsburg synagogue, you don't take chances with people's lives. The vile, threatening slogans scrawled on the synagogue walls are the kind of thing my parents told me about, or I read in books and saw in movies. They weren't supposed to be happening anymore. 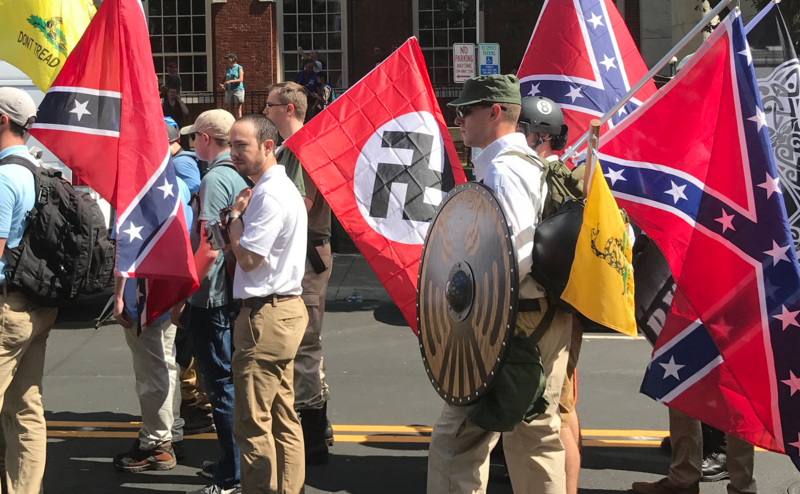 But then again, until two years ago, I cannot remember seeing television coverage of people marching down the street carrying tiki torches and chanting "Jews will not replace us!" The murdering of Jews at the Tree of Life synagogue is said to be the deadliest attack on the Jewish community in this country's history. The same Thursday as the canceled event, two swastikas were found spray-painted in the Upper West Side of Manhattan. Two days earlier, a number of Brooklyn Heights buildings had swastikas chalked on their walls. In the days leading up to this election, George Soros, an 88 year old Jewish investor and philanthropist who contributes to Democratic candidates, has become the official bogeyman of the Republican party. Nancy Pelosi and Maxine Waters have faded into the background. Using Soros as the symbol of rich Democratic donors is nothing new, but recently the Soros/Jew/Democrat connection has moved from dog whistles to bull horns. He was called satanic. A Trump tweet said Soros paid for people to protest against Supreme Court candidate Brett Kavanaugh. Rudy Giuliani retweeted a post saying Soros is "the anti-Christ." At rallies, Trump originally said the migrants walking through Mexico toward the U.S. were funded by the Democrats. Soon after, others were putting Soros' name on the funding. The Jews were bringing the "invading hordes." When Trump was asked whether Soros was involved, he said, "I wouldn’t be surprised. A lot of people say yes." Now at Trump rallies, the crowds chant "Soros! Soros! Soros!" When Trump condemns "globalism" or calls himself a "nationalist," people who aren't familiar with the lore and legends of antisemitism may not hear the historic fear and hatred of Jews echoing in his words. Antisemites do. Where Trump falls on the spectrum of antisemitism is an important question, but not a crucial one. What is important is that he acts the part when he is playing to his base. No one put the idea better than Andrew Gillum, Democratic candidate for governor in Florida, when he was talking about the racist campaign mounted by his Republican opponent, Ron DeSantis. "Now, I'm not calling Mr. DeSantis a racist," Gillum, who is African American, said in a debate. "I'm simply saying the racists believe he's a racist." The same goes for Trump. No matter his personal beliefs, there is no question, antisemites believe he is an antisemite, and that makes them prouder, louder and bolder than they would be otherwise. This is their moment. And that makes this a frightening moment for Jews like me.